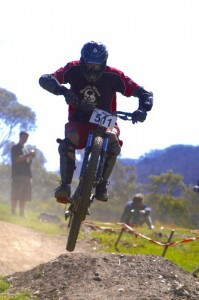 In 2006 I was heavily into downhill racing on mountain bikes, stunt riding, and skimboarding in gnarly shorebreak. We had to wait for the right conditions to skim, but for the bikes we could take matters into our own hands. This pastel dates from about 1984, before I started painting. 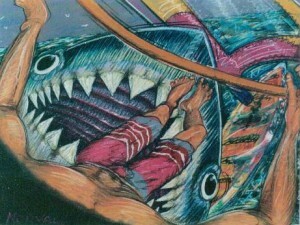 I was windsurfing every day at some very sharky locations. 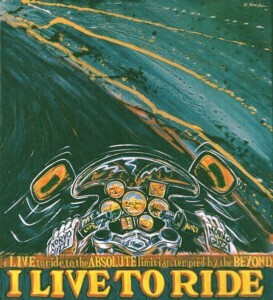 “I Live to Ride”, acrylic on canvas, @54×48″, 1988. I painted this one at the Data Express courier base in Douglas St, South Melbourne. I had a little studio in the corner of the warehouse and I would paint in between jobs. Working as a motorcycle courier was my all-time favorite job and I took to it like a duck to water.